Being a continuation of yesterday’s post, in which I started to outline my plans for the Gift-A-Long. Again, all photos are copyright the designer unless otherwise noted, and are used here with permission. Yesterday, I outlined gifty plans for myself, The Niece, myself, and Nephew 2. Today, let’s start with Nephew 1 and move to some backup plans, put in place just in case I’ve become a completely different person and have underestimated how much time is left in the year. So. Last year, I made the oldest nephew the longest, stripiest, pointiest hat that ever did point. That sucker will be hard to top, but I think I’ve found the way to do it. Mittens. No, really, mittens. 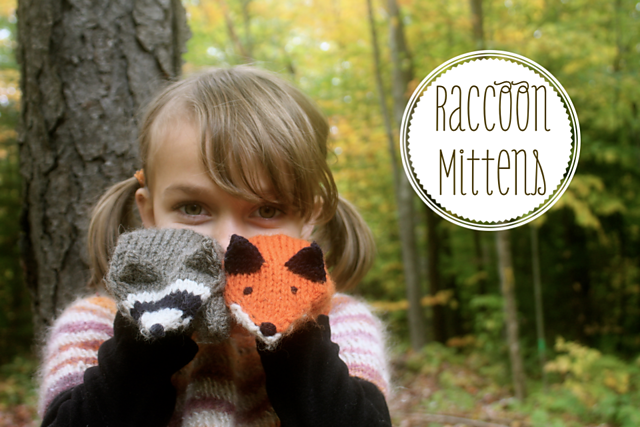 You haven’t seen these mittens yet. 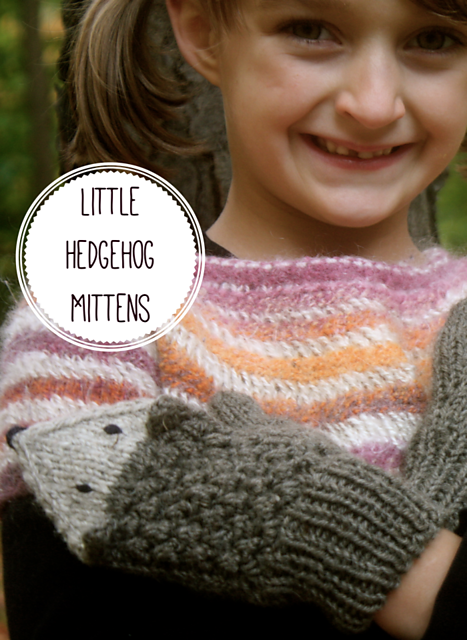 They’re the Little Hedgehog Mittens by Birch Hollow Cottage. She also has Raccoon Mittens and Fox Mittens and Mouse Mittens and Gnome Mittens and oh, lordy, I am dead from the cuteness of them all. Indeed, I’m having a heck of a time deciding which ones to make. 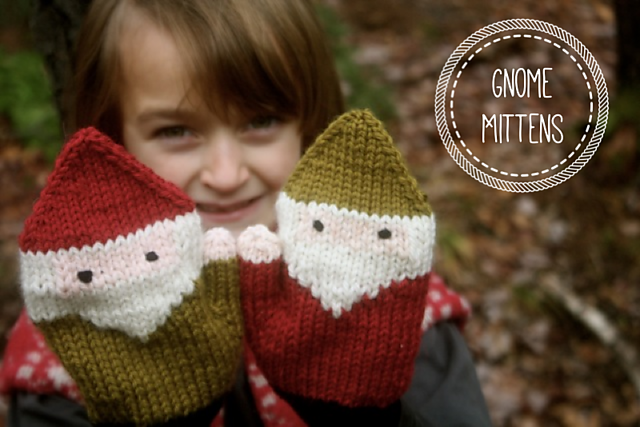 The Hedgehog Mittens are the front runner, but he may get the gnomes. Or the wee mousies. Or the foxes. You see my problem here? Good thing those children have a few more presents coming before they outgrow adorable accessories. I hope. If I finish all the Giftmas things in time, I’ll have been very, very good indeed. Since they’ll have to be shipped to the frozen north, that should leave me with about three weeks before the end of the year to reward myself. 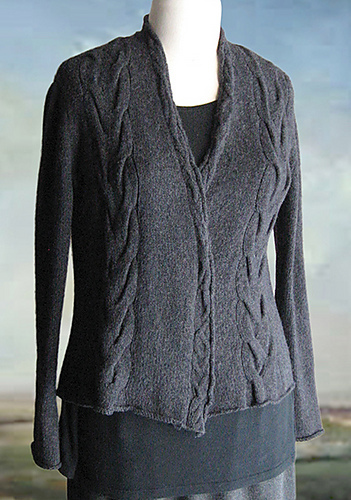 I mentioned yesterday that I was thinking of making Carol Sunday’s Interlochen, but her Twisted Vine Cardigan has been calling my name, too. It’s simple without being boring, and I love all of the details: the rolled edges; the front bands; the single, soft cables up the front; the overall shape. I know I’d get a heck of a lot of wear out of this cardigan, and it’s one of those patterns that I could probably work on while watching an engrossing movie without messing up, yet I wouldn’t be bored to sobs halfway through. That sounds like the perfect combination for a post-holiday project. 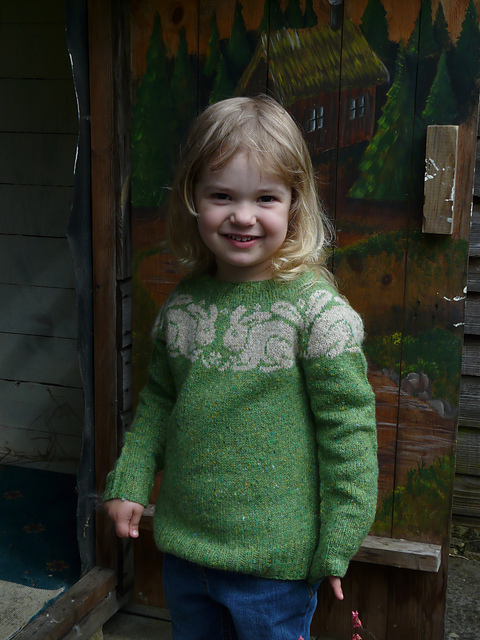 The pattern is Sweet William by Ann Kingstone. Ann wrote the hugely popular Stranded Knits (which has an adult version of this pattern, by the way), and she does wonderful things with stranded colourwork. I mean, those rabbits are the absolute essence of bunniness, no? (She’s no slouch with the cables, either.) I don’t get to make a lot of other folks’ colourwork designs, so I’m happy to find a project that is a) not a huge amount of colourwork, but enough to be satisfying, and b) would look lovely on Little G, which is the perfect excuse to cast on. Finally, my Backroad Hats just became available as an individual pattern download through Interweave Press! It’s even on sale and everything. I was going to make one or two of these as random gifts anyway; now I can join the fun in the Hat & Other Head Things Gift-A-Long. Those are the plans so far; we’ll see how it goes. I’m slowly collecting my Gift-A-Long favourites on a Pinterest board so I have lots of ideas to choose from. Most of those patterns are part of the sale; all of them are part of the event. So what do you think: want to Gift-A-Long with me?